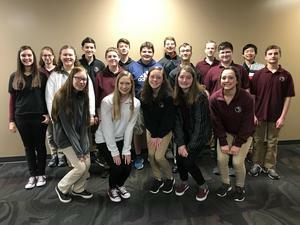 Concordia Lutheran High School welcomed eight new students to the Honors Academy for this spring. These new freshmen are: Madi Dellinger, Andy Deng, Evan Droste, Mike Jessup, Nolan Labahn, Owen McConkey, Mackensie Neumann and Gwyndalyn Widener. FORT WAYNE, Ind. — Concordia Lutheran High School welcomed eight new students to the Honors Academy for this spring. These new freshmen are: Madi Dellinger, Andy Deng, Evan Droste, Mike Jessup, Nolan Labahn, Owen McConkey, Mackensie Neumann and Gwyndalyn Widener. They join the current 12 seniors, nine juniors, seven sophomores and 10 other freshmen. Begun in 2014, the Honors Academy promotes exceptional academics, leadership and community service among Concordia students by challenging and encouraging students to the next level of their academic success. Students are invited to apply for the Honors Academy and are selected based on receiving Pass Plus in English, math and social studies on their seventh-grade ISTEP tests or based on the PSAT test scores during their freshman year. Students then submit a creative response before interviewing with the selection committee. During their four years at Concordia, students are required to take Advanced Placement and dual credit courses; maintain a minimum 3.75 GPA; attend lectures and training for leadership awareness; engage in cultural growth and community networking; and complete community service hours each year, ranging from 15 hours as a freshman to 35 hours as a senior. Upon graduation, these students will receive distinctive recognition and a special notation on their high school transcripts. To learn more about the Honors Academy, contact Luanne Erdos at lerdos@clhscadets.com or (260) 203-4575 or visit www.clhscadets.com/honors-academy.